I love to transit via Changi Airport in Singapore. Particularly if it is a long transit, I definitely want it to be via a happening airport like Chnagi. 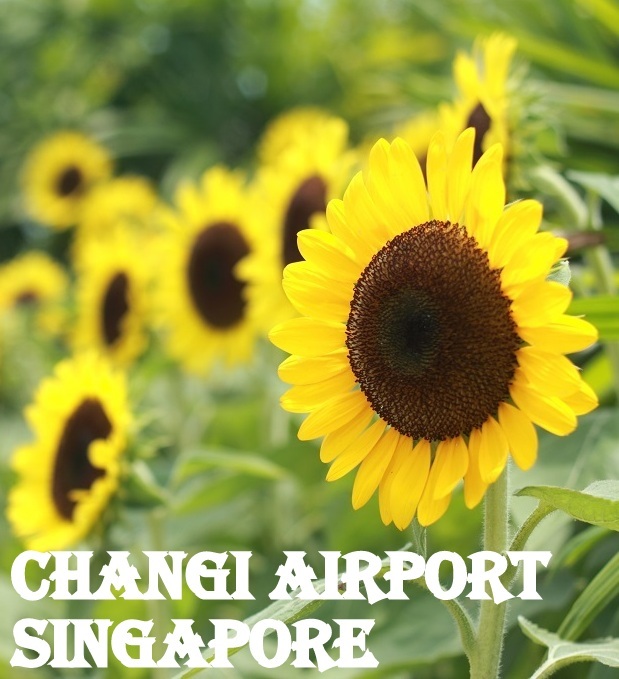 If you are at Changi there are many things to do. To make the most of the experience just download the iChangi App and get started. If you download the iChangi App your Wifi access is also free for 24 hours. The WiFi speed at the airport is amazingly good at Changi! While I was coming back from Manila I had a six and a half hour layover. I used it to explore all the terminals. Even with 6 hour layoff, I ran out of time. If you are a transit passenger at Changi you first need to check out the Changi Transit Program. If you are a transit passenger at Changi you can avail shopping voucher if you are flying, say Delhi-Singapore-Manila and back on Singapore Airlines, SilkAir or Air New Zealand. You can collect shopping vouchers worth SGD 20 to spend at the select outlets within the airport. It used to be SGD 40 earlier. I was flying Delhi-Singapre-Jakarta but I was flying back Bali-Singapore-Delhi. I went to the iShop voucher counter and asked if I was still eligible? And the answer was yes. So do remember that if you are a transit passenger via Singapore on the above mentioned airlines you can now shop with your vouchers. Do check out the link above for inclusions and exclusions. I missed out the city tour by a few minutes. 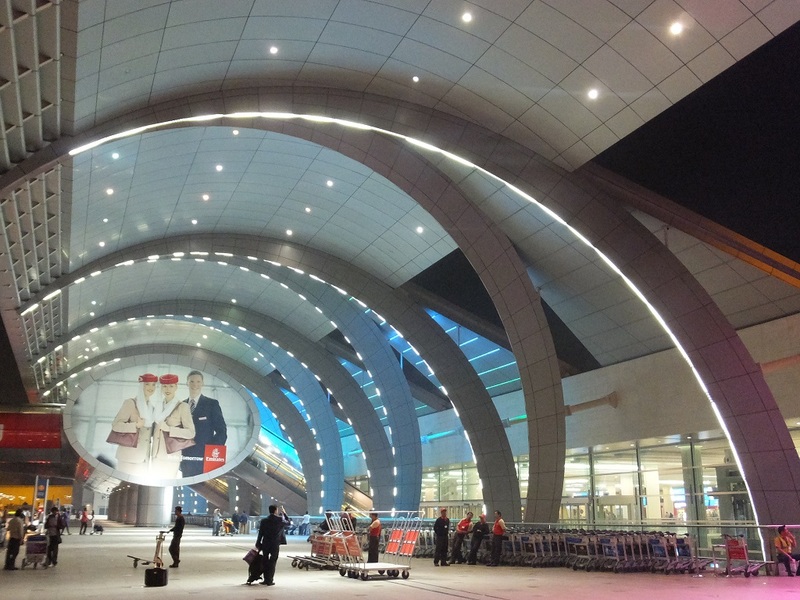 If you have a lot of time, there are fixed departure city tours for transit passengers. I missed it by 15 minutes as I don’t pay attention to the departure times. If you have any trouble in locating the counter just ask at one of the information counters. There are many throughout the airport and the people are helpful. If you do not have enough time, there is a lot to do at the terminals and the iChangi App is the best place to start. Each airport has its unique set of attractions. You can travel between terminals via the Skytrain. 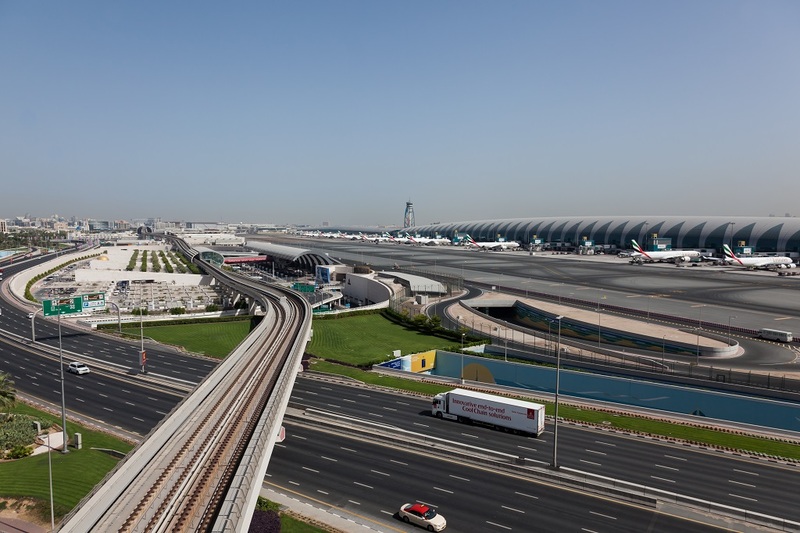 There are buses between the terminals too. I hear that there is a Skywalk too but I have never used it. You go to the Social Tree to have some social media fun. You stand at a terminal, get your picture clicked and save it in the tree. It is silly fun but then at airports I can indulge in silly fun! I think you can retrieve your photo later but I have not tried it personally. When I was flying to and from Indonesia I had very little time at the airport. 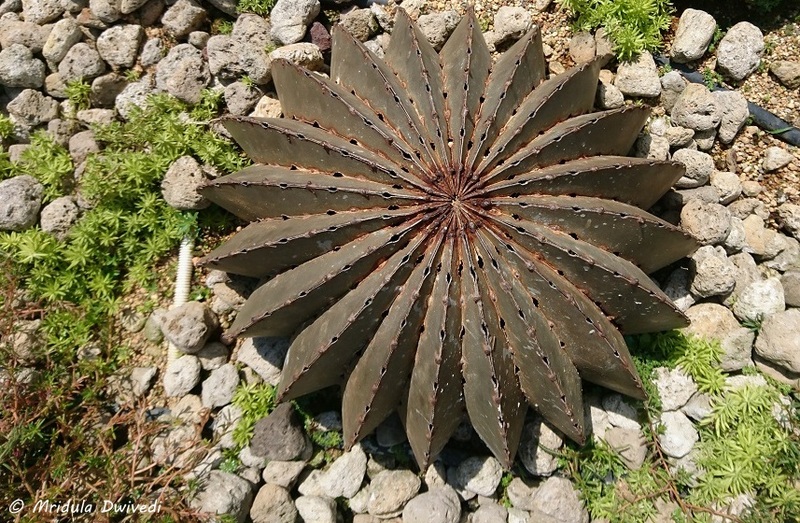 Do you like cactus? Then go explore the cactus garden on the roof of T1. It has about 100 species from all over the world. If you don’t like cactus, well there is a bar too! 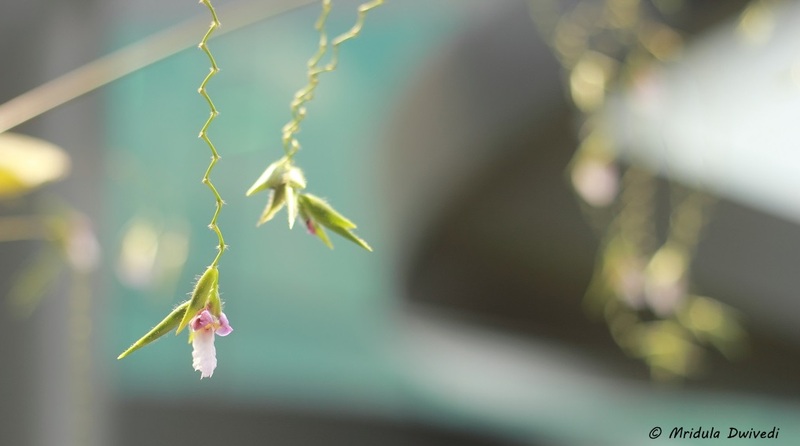 The Piazza Garden in T1 displays seasonal plants, with a special focus on the local culture. The iChangi App clearly shows the location of each attraction. However, if you are like me, you can always ask the good folks at the information desk if you cannot find an attraction! They always set me in the right direction! There are three tall tree like structures in the garden where you can walk around on the ramps. 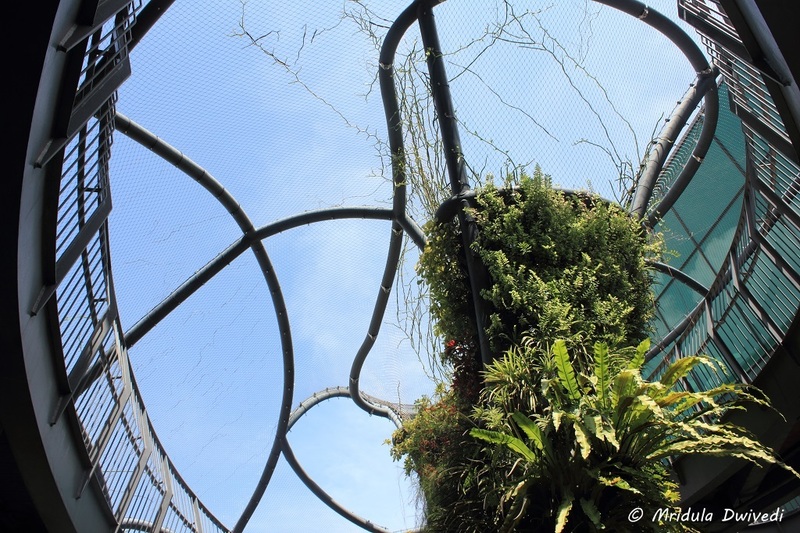 The structures are covered in greenery and plants. 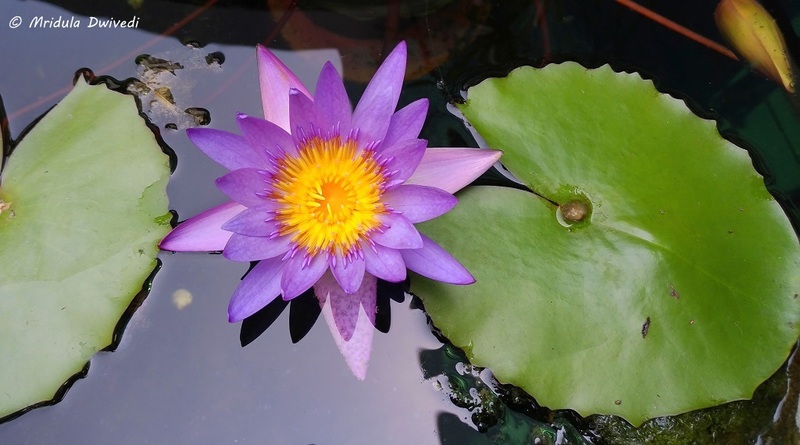 The Water Lily Garden at T1, as the name suggests, features water lilies. 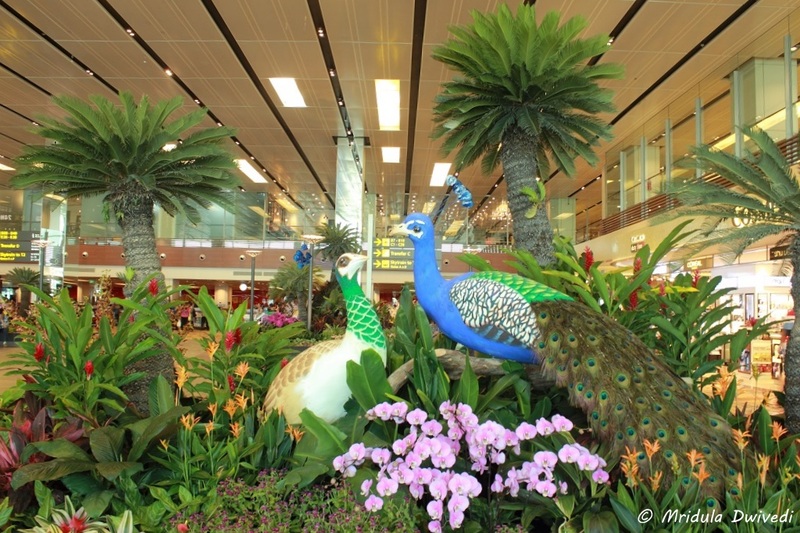 The gardens are not too big but it is a pleasure to come across them at an airport! There is Kinetic Rain at T1 as well, but I was told it is after immigration. So I could not see it. The top attraction for me at T2 is the Sunflower Garden, do look out for it on your transit. If I have to pick up a personal favorite it would be a tie between the Sunflower Garden at T2 and the Butterfly Garden at T3. 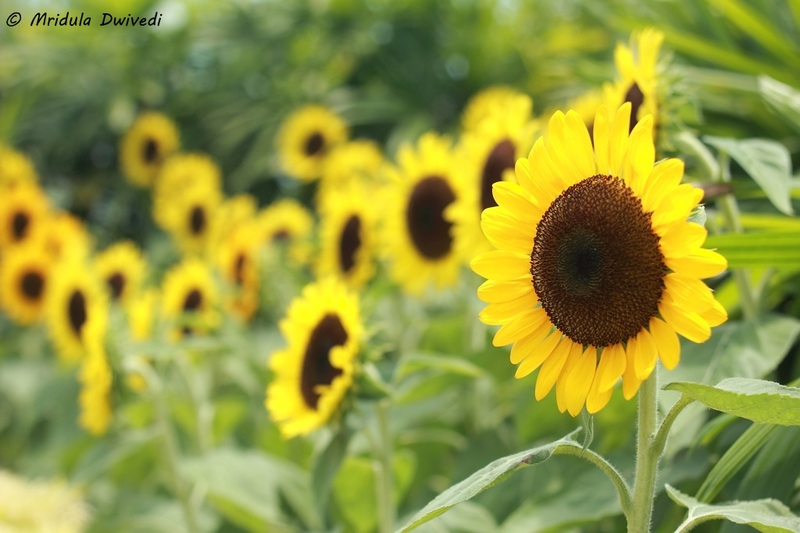 At the roof top there are rows and rows of sunflowers to enthrall you. I am told that the view is entirely different at night. But as of now, I have only been there during the day. One can see the runway too from the garden. 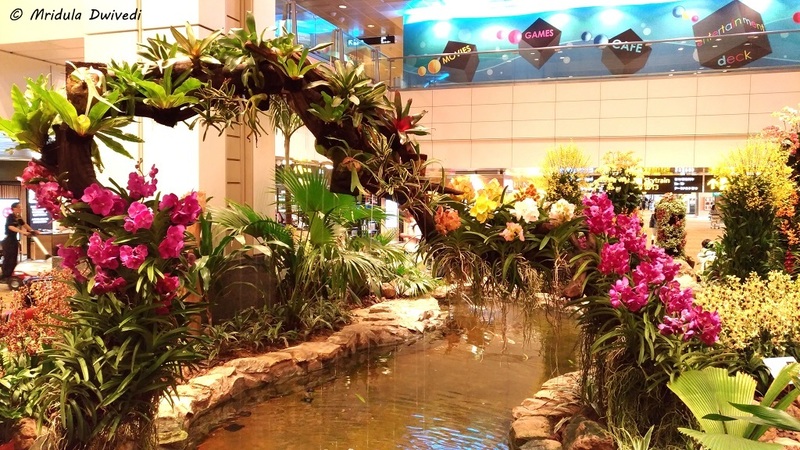 The Enchanted Garden is one the most popular spots at Changi to click selfies and family pictures. I have always found it crowded. The sounds in the garden are apparently triggered by motion sensors. I am a big fan of the floral arrangement in the garden. 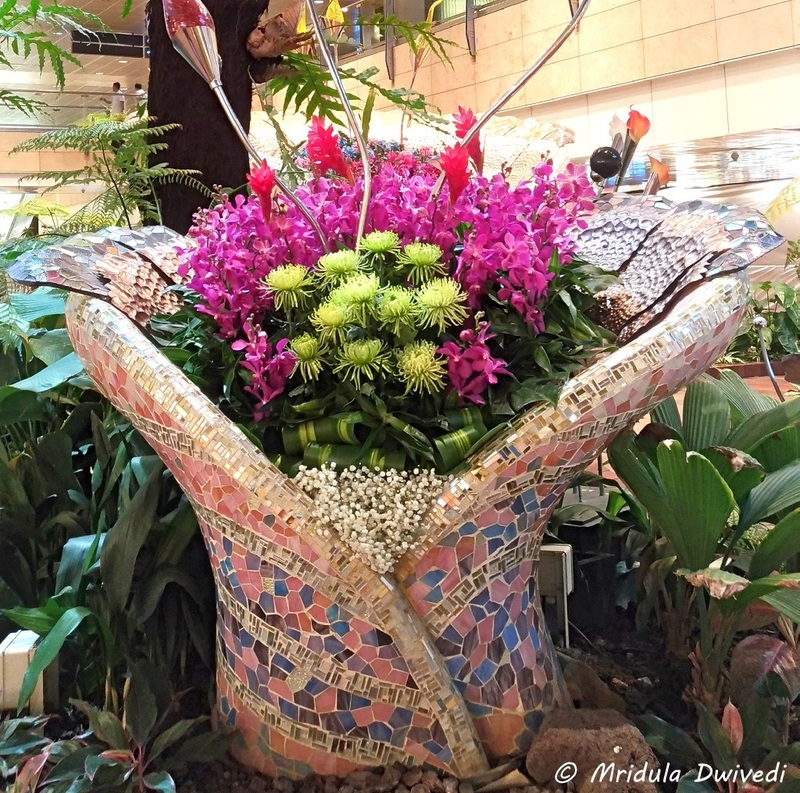 I find orchids everywhere at Changi. But there is a garden dedicated to them at T2. Please remember that at times some of the gardens might be closed for renovation and repairs. My flight was from T3 hence I left it for the end. I spent so much time at T1 and T2 that I hardly had any time left at T3. So T3 for me was a rushed affair. As I said it is a tie for me between the Butterfly Garden and the Sunflower Garden. I spent a lot of time at both the places! 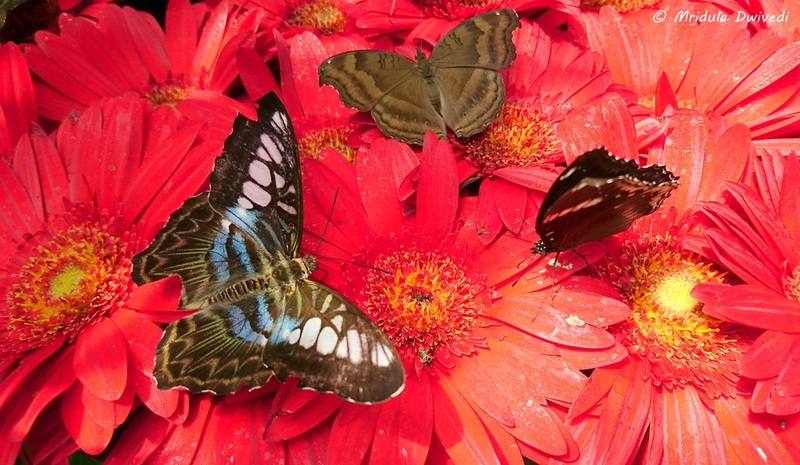 But I think I clicked a lot more pictures at the Butterfly Garden! 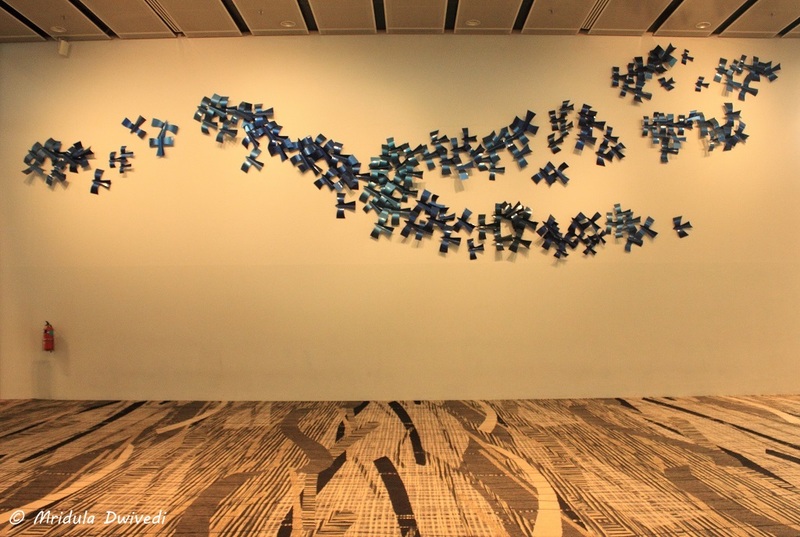 The Birds in Flight is an art installation at T3 by the artist Baet Yeok Kuan. It is inspired by the Arctic Tern’s bird migration. There is much more at T3 like the Daisy, Floral Inspirations, Going Home, Saga Seed, the Slide etc. I have marked them for the next trip, whenever I have time at Changi again! 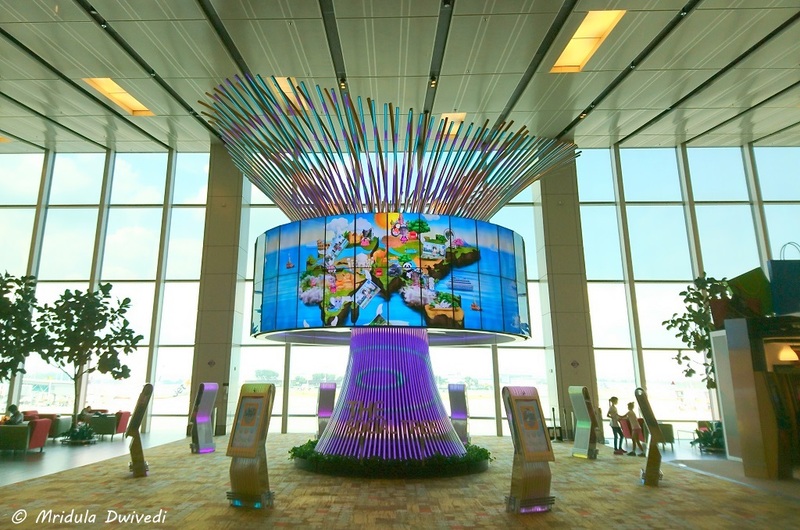 This is a glimpse of Changi and what to do if you have about 6 hours of transit time at the airport! I am sure there is a lot of shopping at the airport but what I have mentioned in this post is all are free! However, the city tour would be my first priority if I have that kind of time again! PS. My Flights on Singapore Airlines to Manila and Jakarta and back, were sponsored by the Philippines and Indonesian Tourism Boards respectively.